Milton Ulladulla Times By CHRIS DOBIE SHOALHAVEN motor racing outfit MRTeam have proven they are serious about their future in the sport with an impressive debut appearance at the world famous Mount Panorama motor racing circuit in Bathurst. Milton racing brothers, Reece and Ryan Marchello, stunned their... Read more. 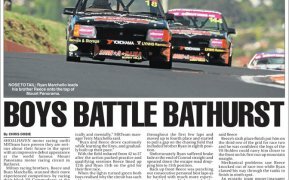 Milton Ulladulla Times ON Friday, November 23, MRTeam accompanied the Today - Weather Segment at Sydney Motorsport Park for the Celebrating Motor Racing History - Tasman Revival. With an early start planned for the... Read more. Milton Ulladulla Times The efforts of local apprentices Ryan and Reece Marchello are nothing short of inspiring, according to the Australia Business Apprenticeship Centre. Vocational training is the driving force behind... Read more. South Coast Register SOUTH Coast based V8 racing crew MRTeam enjoyed an exciting and eventful weekend on November 3 and 4 at Goulburn’s Wakefield Park Raceway for round six of the NSW Motor Race... Read more. Milton Ulladulla Times MRTeam SOUTH Coast based V8 racing crew MRTeam took part in their final state championship race of the season. MRTeam competed at Goulburn’s Wakefield Park Raceway on the weekend for Round 6... Read more. South Coast Register SHOALHAVEN based V8 racing crew MRTeam is gearing up for their final state championship race of the season this weekend at Goulburn’s Wakefield Park Raceway. Round six of the NSW motor racing... Read more.